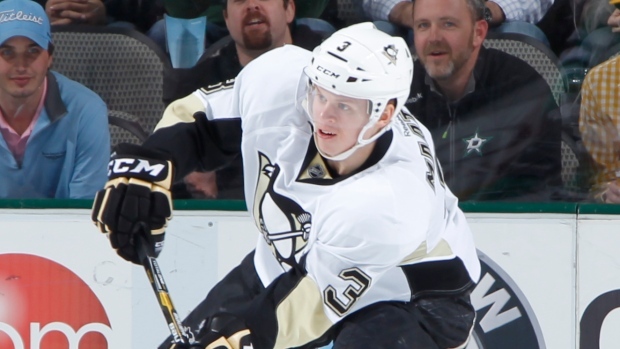 PITTSBURGH, Pa. - Pittsburgh Penguins defenceman Olli Maatta is the third member of the team diagnosed with mumps. The Penguins issued a statement Friday that Maatta tested positive for the virus and remains in isolation. Goaltender Thomas Greiss and defenceman Robert Bortuzzo tested negative. Teammates Sidney Crosby and Beau Bennett were diagnosed with mumps in the last week. Crosby missed three games but returned for Thursday night's overtime win against Colorado. Bennett tested positive on Monday and remains out indefinitely with a lower body injury. Maatta is already out because of an upper body issue. The 20-year-old missed two weeks this season after surgery to remove a cancerous thyroid tumour. The mumps is spread through infected saliva and causes facial swelling and fatigue. There's no specific treatment for the virus, with symptoms lasting up to two weeks. The Penguins host Florida on Saturday night.